Are you still waiting for that day wherein you can use whatever it is you studied in Geometry? This is your lucky day! We are going to talk about a tessellation known as Rhombille Tiling. It is more commonly referred to as Tumbling Blocks and Cubeworks. The pattern has been in existence since the early 19th century. It is an artistic trompe l’oeil made of a catena of alternating cubes. It is also considered as a hatching pattern known as Escher – named after the Father of Tessellation, M.C. Escher. The fusion of remarkable design and colors makes Rhombille Tiling one of the most irresistible patterns that have ever been created. It has been used and abused for a lot of years – from quilts to floor tiles. A personal favorite of ours is the latter, but using this pattern in furniture is never far behind. Below are some examples of how to incorporate this amazing pattern in your home. Since the Rhombille Tiling pattern is busy, it is a safer choice to leave the rest of the room in solid color. You can make the floor your statement piece for the entire room, and point the rest of the décor to that. In other words, do not upstage the star of the interior show! The color schemes of the tumbling block tiles above are neutral and subdued. It is a great base to add an intense color to. Teal and orange definitely vitalized the room, giving it a modern-retro feel. Mixing patterns is a big do when done right. In the case of this specific geometric design, you can opt to incorporate stripes or windowpane checks in moderate scale. 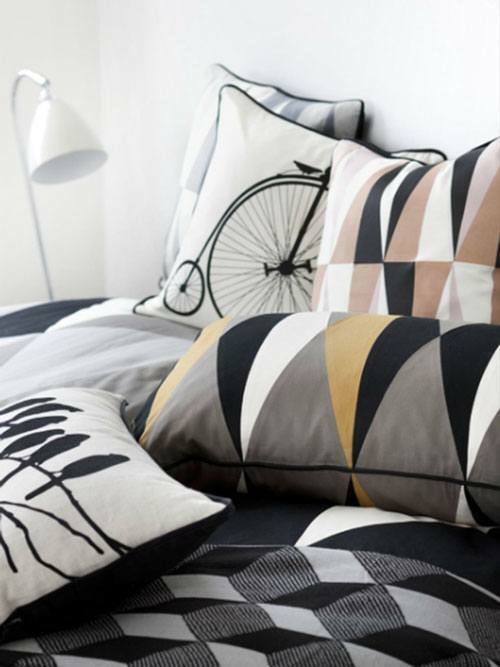 Don’t overdo the patterns because you need an aesthetic balance to rest your eyes. 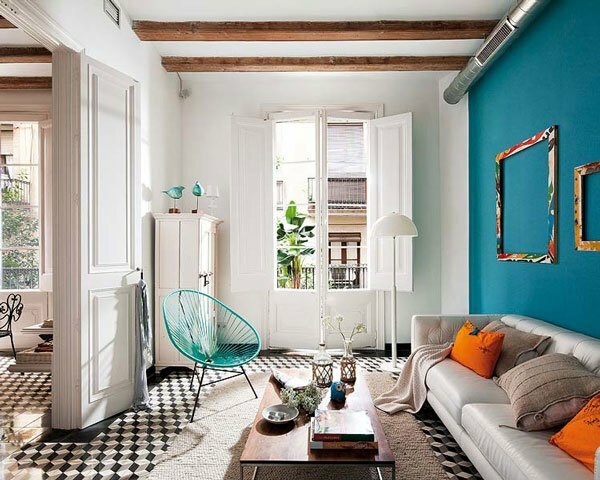 If you are falling in love with rhombille tiling, but don’t have the guts to fully commit to something huge such as floor tiles, go for furniture! 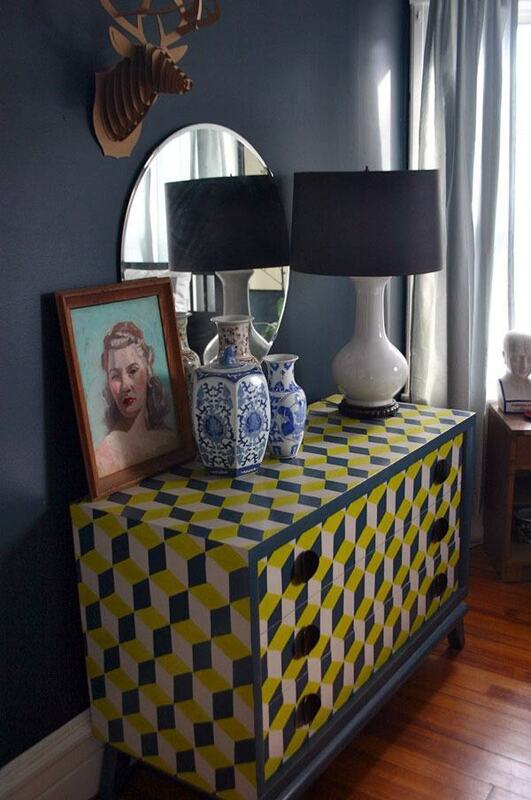 Repurpose a dated piece such as the bedroom dresser above into an eye-catching piece! It is a great way to add a good impact to a specific space. If the rest of the room is in dark tones, paint your surprise piece in vibrant hues. The pattern itself will make the room less boring; coupled with bold colors; the furniture will certainly be an attention grabber. If the color combinations of the drawer are used all throughout the room, it will serve as a piece that will unify the whole space together. Delight your guests as soon as they transpierce your home! A rhombille tiling console in the entryway is a fresh counterpoint to an immaculate wall. You don’t have to add much décor to make the area look fantastic. The pattern does that for you. 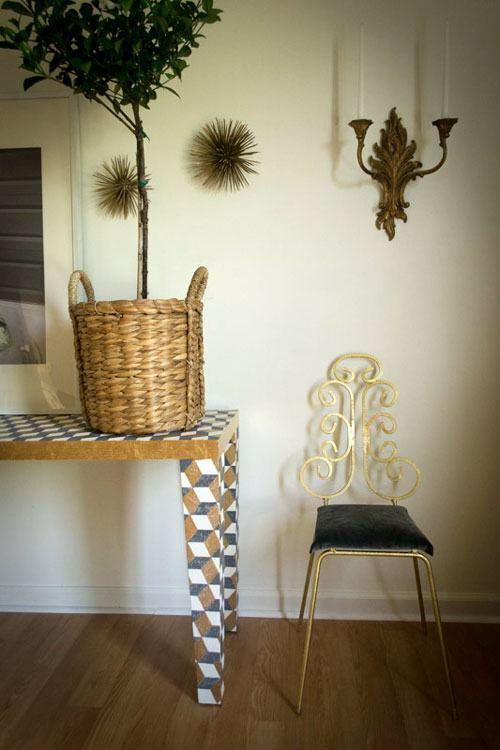 A little bagatelle here and there (such as a spike urchin wall ornament and a woven basket planter) is enough to create a tasteful interior oddity. Rhombille tiling has an immense degree of complexity yet the design is still undoubtedly clear-cut, making it a great wall art décor! 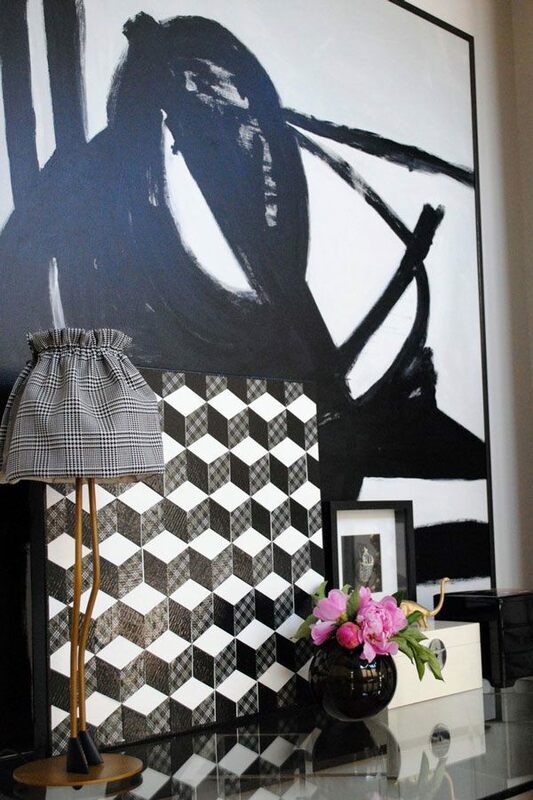 A small canvas is enough to make it standout, and bring buzz to a two-toned space. Beddings are the simplest and easiest to modify when you want to add rhombille tiling to your home. It’s also less expensive and can create the kind of impact you’re going for! If you prefer tumbling blocks to dominate the room, go for a comforter. Fancy it as a small add-on? Two words: Decorative pillows! You can pile up different patterns as long as the colors are congenial to one another.